My recipe for the second day of Blogging Marathon is "Paneer Paratha". Although the methods for making stuffed paratha are similar to each other, some find it a bit difficult to make a perfect paratha. One of my readers told me that though she followed all the steps mentioned, she still faced difficulty while rolling, as the filling often kept leaking out from the dough. So, I have decided to post another method of making stuffed paratha. This method is easier than the previous one. However, it is up to you to decide your comfort level and choose the method accordingly. Oil - 2 tablespoons or as required for cooking parathas. 1) Take flour, red chilli powder and salt in a mixing bowl. Add water little by litlle and make a soft dough. 2) Coat it with oil. Cover and keep aside. 3) Meanwhile prepare the stuffing. 1) In another mixing bowl or wide plate, crumble paneer. 2) Add green chillies, coriander leaves, amchoor powder and salt. Mix well. Remember to add correct amount of salt as we already added it to dough. 3) Taste and adjust the amchur powder and salt. Keep it aside. 1) Divide the dough into 16 small sized lemon balls. Make sure the size of the balls are identical. 2) Take two identical balls and roll them to approximately 15 CM round disc as we roll for chapathi. Please refer the picture below. 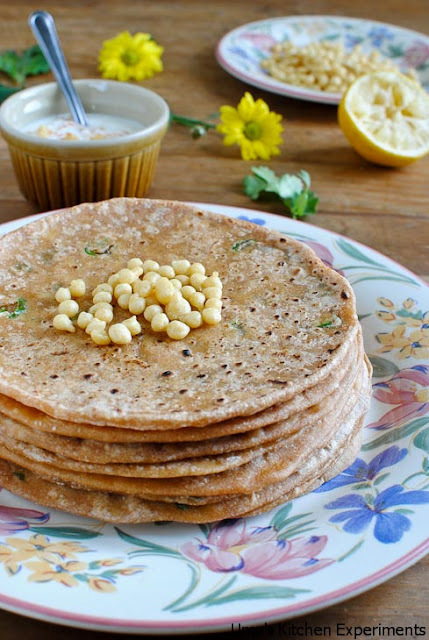 3) In one rolled chapthi, spread a generous tablespoon or more of paneer mixture. Leave little space around the edges. 4) place another rolled chapthi over it and seal the corners. If required, seal it with the help of water. 5) Sligtly roll it using rolling pin. Repeat the steps for making other parathas. 6) Heat the skillet. Cook the paratha with the help of oil. 7) Serve with raita or pickle. Lovely clicks.....great presentation ....and yummy recipe dear!!! 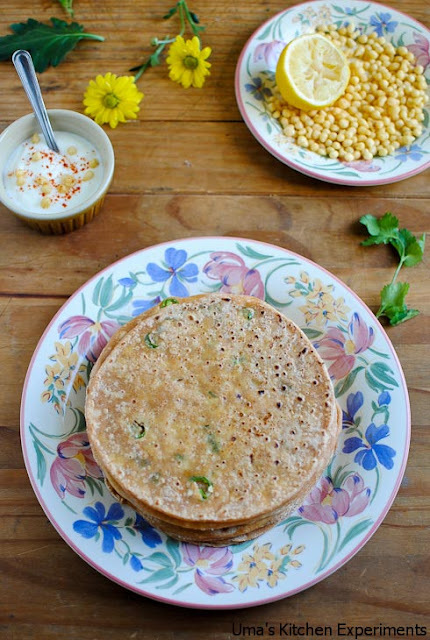 lovely parathas and great pics! aaha- just lipsmacking parathas- love it ! Paneer paratha looks extremely irresistible and prefectly done,lovely..
Great presentation and looks superb! Wonderful presentation Uma. Well explained step by step pics. So soft & so inviting!! Delicious and yummy looking paratha,awesome presentation. your parathas always look so perfect and gorgeous! 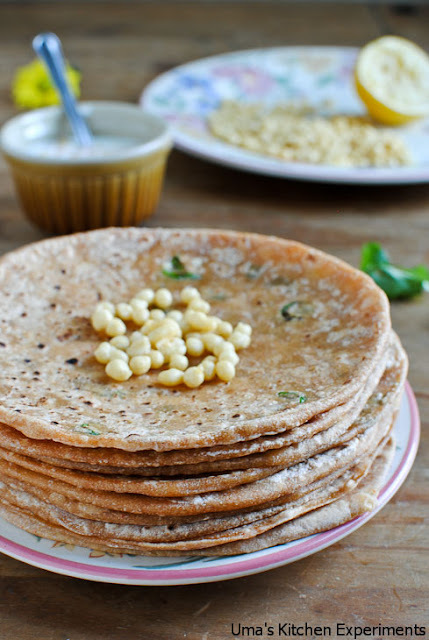 Easy way of preparing parathas..looks tempting n good healthy !! 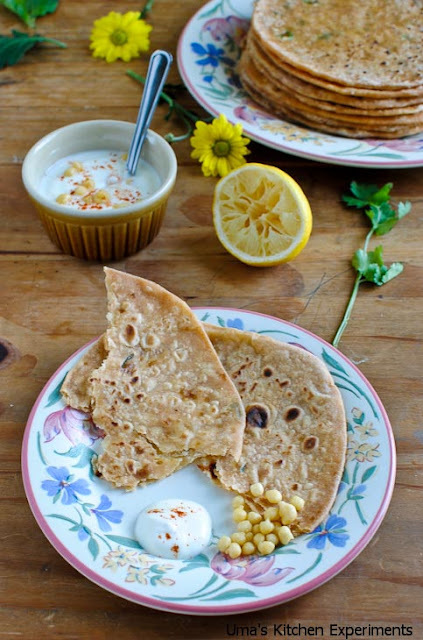 Wow wat a delightful and super tempting parathas..
wow this looks yum....awesome clicks.